Caroline Hallisey-Kepka draws on her Olympic experience to motivate her students at Glen Urquhart School in Beverly. Caroline Hallisey-Kepka never believed in the power, or influence, of a home crowd until she toed the starting line for the women’s 500-meter Olympic final in short track speed skating at Salt Lake City in 2002. Caroline Hallisey in the 500m finals heat during the U.S. Olympic short track trials in Kearns, Utah. “I always thought it was a bunch of baloney,” acknowledged Hallisey-Kepka, now a fifth-grade teacher at the Glen Urquhart School in Beverly. The only unranked skater to advance to the final, she placed fifth — just a half-second behind gold medalist Yang Yang of China. It was the most cherished moment of her Olympic career, said the 33-year-old Natick native, who also competed in Winter Games in Nagano in 1998 and Turino in 2006. As the 2014 Games play out in Sochi, Russia, Hallisey-Kepka is intently watching from afar, keeping track of her friends and former teammates. Inside the classroom at Glen Urquhart, an independent school for grades K-8, she strives to provide her students with the motivation to succeed and achieve their goals, much like the overwhelming support she received in Salt Lake City. “I chose teaching this grade because my middle school years were really challenging for me, so I wanted to teach that middle school age to try and give these kids the tools I learned when I was training as an athlete — how to overcome challenges they will face,” said Hallisey-Kepka, who lives in Exeter, N.H., with her husband, J.P. Kepka, also a speed skater and a US bronze medalist in 2006, and their 15-month-old daughter. While Hallissey-Kepka empowers her students to do well in the classroom, she also gives them the positive mind-set to succeed as young athletes. One of her students, 10-year-old Alex Furse, said that Hallisey-Kepka helps her when she is confused. “She always explains it even if it still doesn’t make sense, so she explains it in a way I’ll understand,” said Furse, who swims and plays basketball. Another student, Maya O’Connor, loves watching the Olympics and the speed-skating events that her teacher used to compete in. She said Hallisey-Kepka “also does a really good job going over things with us, because when we do it wrong, some just say, ‘You did it wrong,’ but she teaches us how to do it right. “She helps us out and really encourages us,” added O’Connor, 11. Hallisey-Kepka tries to convey many of the lessons to her students that she learned as a competitor. Most importantly, she tries to help them realize their potential and the benefits of hard work. 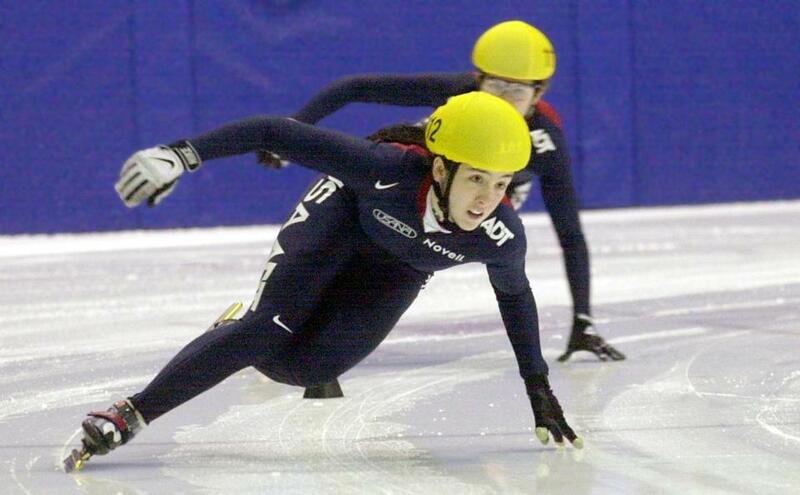 That was the foundation of her speed skating career as she began to chase her Olympic dream. Her parents were recreational speed skaters, so she was on the ice at age 2. Two years later, she competed in her first race, through the Bay State Speedskating Club. After watching Karen Cashman compete for the United States at the 1988 Games, Hallisey-Kepka was eager to perform at a higher level. By the end of eighth grade, she was accepted into the US developmental program in Lake Placid, N.Y., and relocated, while attending Lake Placid Central High School. Even then, the thought of qualifying for the Olympics was a pipe dream. “I figured I had an opportunity to train and go to Junior Worlds, but at that time the Olympics seemed like a far-off reach,” she said. Now that Hallisey-Kepka is two Olympics removed from her last performance, she said it has become easier to watch the games. Although her days of skating competitively are behind her, she and her husband have continued to be ambassadors of the sport. When she is in the classroom, it does not matter whether her students are aware of her decorated athletic career. To Hallisey-Kepka, all that matters is that she helps her students get better every day. “Some of them look at you with these wide eyes and you can see they’re just soaking every second of it in, and you’re always going to have some kids that are like ‘yeah, whatever,’ but that’s what you expect; everyone is different,” she said. Anthony Gulizia can be reached at anthony.gulizia@globe.com.